Except perhaps for those who reside in the northernmost reaches of the country, gardeners welcome the New Year’s lengthening days in eager anticipation of the spring planting season. While spring doesn’t officially start until March 20 in the Northern Hemisphere, if you’re a gardener, it’s never too early to starting thinking about and planning your summer garden. And, even if it’s typically too cold in your area to realistically plant outdoors until late spring, you can always get a jumpstart on the growing season by starting plants indoors from seed. When to Start Vegetable Seeds Indoors? The best time to start summer plants indoors from seed depends on where you live and what you want to grow. You can sow most vegetable seeds indoors for summer harvest 4-8 eight weeks before your last anticipated frost. Indeed, if you live in a northerly planting zone, it may be necessary to do this with those vegetables that take a long time to mature, such as Brussels sprouts. Starting plants from seed indoors is an easy way to extend your growing season. While you can purchase your seeds from us, you’ll need to get the other supplies from your local nursery or online retailer. First, decide what you’re going to grow. Don’t be starstruck by the beautiful four-color photos of model plants in gardening catalogs. You need to do your research beforehand, choosing appropriate plants for your situation to increase your chances of success. If you’re new to gardening, you don’t want to start with plants that are fussy, prone to pests and otherwise difficult to grow. Start with something relatively easy that will have a big payoff. Leafy greens, such as lettuce, arugula and Swiss chard are easy to grow and harvest before it gets too hot; certain varieties of tomatoes—cherry tomatoes, for example—and most herbs are also good bets. If you want to start with flowers, it’s hard to go wrong with most of our selections. Just don’t plant too much at once when starting out! The seeds can be planted in almost any kind of container that’s at least 2-3 inches deep and has drainage holes. You can find special multi-seedling trays for this purpose or peat pots that can be planted directly into the ground when the time is right. 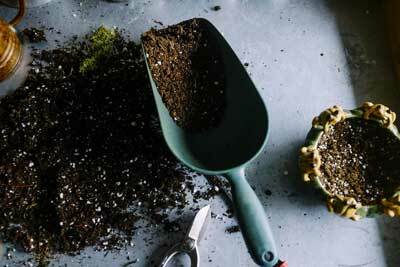 Choose a fresh potting mixture especially formulated for seedlings—which won’t actually be soil, since seedlings do best in a sterile growing medium—and pre-moisten it in a bucket before filling the potting containers. All seedlings demand moist (not soaking wet) soil, so it’s helpful to moisten it beforehand. Pack the soil down before adding the seeds. All Bentley Seeds seed packets provide instructions for how deep to plant the seeds—usually ¼-1” deep. You can do this by gently pressing them into the soil. Large seeds should be planted a little deeper than small seeds. You can plant 2-3 seeds per container just to be safe. And, some seeds are just so small, it’s hard to plant just one. After planting, gently add a little more water. Watering seeds and newly-germinated seedlings can be tricky, by the way, as a strong stream of water will either wash them away or drown them! You will want to invest in a mister or small watering can for this purpose. Depending on where you live and the natural light in your house, you might be able to get away with starting seedlings indoors without using grow lights and heat mats, but that would be the exception and not the rule. To get a healthy start in life, new plants need a lot of light and warm soil. We provide recommendations regarding optimal air and soil temperatures in our vegetable Growing Guides. While the ambient average air temperature in most houses is adequate for most plants, they will reliably germinate only when the soil temperature is between 65° and 75° Fahrenheit. And, for most plants, the warmer it is, the sooner they will germinate. If it’s too cold, the seeds won’t germinate and may end up rotting in their pots. The easiest and most efficient way to increase the soil temperature to adequate levels is by using a heat mat. Inevitably, given the over-planting practice recommended above, you’ll probably end up with some crowded clumps of seedlings. Plants grow best when they have plenty of space and air around them. So, to ensure your plants’ success, you must thin out these crowded seedlings when the time is right. You can thin out the seedlings any time after their true leaves appear. These are not the leaves that first emerge upon germination—those are called cotyledons which serve to nourish the nascent seedlings. Rather, true leaves emerge a few weeks after germination and look like mature plant leaves. Thinning seedlings involves discarding “excess” plants to ensure that others thrive. Many budding gardeners tend to feel trepidation faced with this task for the first time. For starters, it just seems wrong to discard promising new plants. Also, given the delicate nature of the tiny seedlings, it’s hard to figure out how to discard some without harming the designated survivors. But, trust us (and all the other experts out there), thinning the seedlings is what’s best for your plants. It will help the remaining plants develop healthy root systems and grow into sturdy mature plants. And, it’s not hard to do. Just take some small sharp scissors (better than garden shears) and gently snip the excess plants off—right at the soil line. By the way, for certain edible plants, like arugula or nasturtium, you can use the discarded seedlings as a delicious addition to a salad or sandwich. 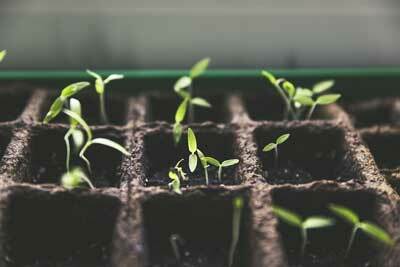 Before too long, the time will come to transplant your seedlings outdoors in the garden. For most plants, this will be after the threat of frost has passed and the plants have three to four true leaves. First, though, you need to harden off the young plants. This involves setting the plants outdoors in a protected location, away from wind and direct sun, at first, a few hours a day. Gradually, over the course of two weeks or so, you can increase their exposure, readying them for planting in the ground. Even after hardening off, the seedlings remain fairly delicate so take some care planting them in the ground. Prepare the garden bed in advance by enriching the soil as we recommend in our Growing Guides make sure it’s well-moistened. To avoid the possibility of the sun drying out the plants, we recommend planting in the late afternoon or on a cloudy day. 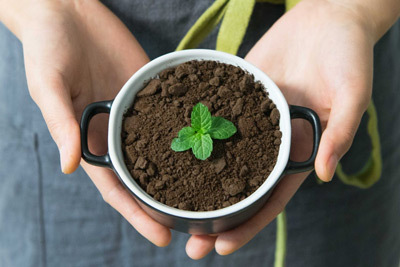 Use a knife or other small implement to gently loosen the soil from the edge of the pots and gently tip the pot upside down to release the intact contents into your hand. Then gently place the root ball into pre-dug holes in the garden bed, to which you’ve added some time-release organic fertilizer. If you’re using peat pots, you can plant them as is. Be sure not to plant the seedlings too deep; all leaves should be above ground. Fill in the gaps with soil and tamp it down. Gently add water after planting and cover the soil with mulch, taking care not to disturb the plants’ roots. And, then wait. If all goes well, you will have some nice, healthy plants that will bear delicious fruit in due time. As daunting as it may seem at first, starting plants from seeds indoors is not hard as long as you follow a few cardinal rules. Keeping the seeds/seedlings consistently moist, but NOT soaked, is one of them. Light, air temperature and soil temperature also play a big role, so be sure to give the plants what they need, as outlined in our Growing Guides. And, make sure you don’t plant the seeds too deep: pay close attention to the seed packet planting instructions. Like most things in life, after you’ve done this a few times, you’ll look back and wonder why you thought it was so intimidating. It’s actually a piece of cake.